Hello. My name is Ryan Stewart and I’m a recovering black hat SEO. I’m not ashamed to admit it. I used black hat methods because they worked. Really, really well. Everything changed 8 months ago when Google dropped the hammer on private blog networks. My entire link strategy went out the window and I had to adapt. Fast. Manual outreach. Online PR. Relationship building. I was working 20 hours a day trying to growth hack all these well-known White hat link building techniques. White hat SEO is a ton of work. There are no shortcuts. White hat SEO works. Really, really well. I’m going to share with you 3 white hat link strategies I picked during the course of my efforts. 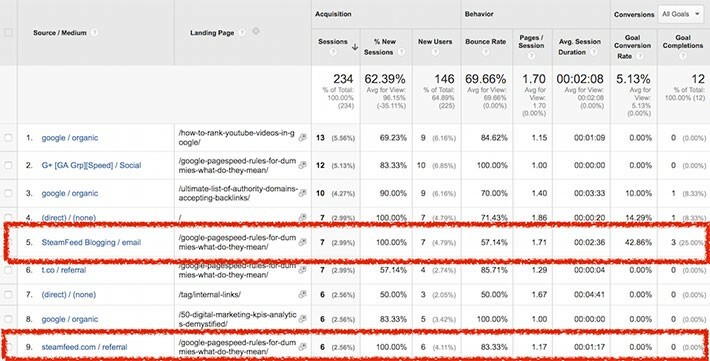 You can take these strategies and apply to any SEO campaign. I promise you, they work. That’s right — the original link spam! In a Google Webmaster Q&A forum, Matt Cutt’s stated blog comment links are perfectly fine. In fact, it’s a practice he uses himself. Blog comments are a great way to promote content, diversify anchor text and build out a natural link profile. But it becomes a bad practice when you outsource, automate, comment on spammy sites and jam keywords where your name should be. It starts with finding a high quality blog that’s relevant to yours (or the site you plan to link to). The blog comment links I build come from blogs I read regularly and others I find on my Twitter feed. If you’re looking for topical niche blogs, use Google blog search + advanced search operators. 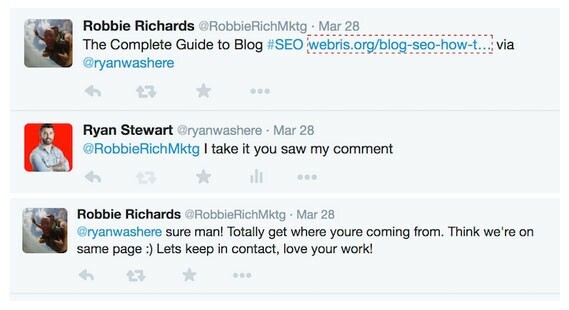 This command tells Google to find blogs based on your keyword containing the word “comment” in the page. This will bring back results of pages that have comments enabled on the page. You can then check the Ahrefs rank for each of these blogs to identify which of them are worth your time. 99.99% of quality blogs will send comments to a moderator before going live. Since you’ll be dropping a link, it’s important to comment the right way. Name field — put your name there, not your target keyword! This spam tactic will get your comment denied every time. Email field — any valid email address will do (real or fake). Website field — I generally leave this blank. Since you’re leaving a link in the body of the comment, it shows the author you’re not trying to spam their blog. Comment field — Pick one point from the post that’s relevant to your link and expand on it. Let’s go through an example of a recent blog comment of mine. A few weeks ago I read a great post by fellow marketer Robbie Richards. I landed a comment link on a high authority blog + additional social exposure. Not bad for a blog comment, right? Not bad for a simple blog comment! No, not PR submission sites. I’m talking about real press from authority news sites. Real press is hard to get. Reporters are bombarded with coverage pitches on a daily basis. The problem is, 95% of those requests are irrelevant. Instead of forcing your business to a journalist, try adapting their column to your business. Start local. 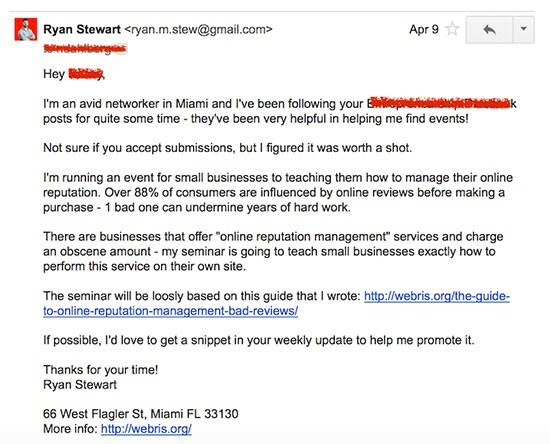 I run a Miami based SEO agency — Miami outlets are more likely to cover my business than Boston ones. Niche down. What exactly does your business do? If you run a bakery, search for columns featuring food. If you have an app, search for columns featuring tech businesses. If you’re a start up, search for columns featuring entrepreneurs. I hunt using Google search operators. Use this command when you know the site you want to search. This search operator tells Google to comb the Miami Herald and bring back pages with the keywords that follow. The keywords I’ve chosen are some I’ve had success with. I encourage you to experiment with others to find one aligning with your business. Use these command when you don’t know sites to target. This scenario happens if you’re an agency servicing an out of state client (i.e. a Boston agency looking for press on a Miami based client). Entering “inurl:” or “intitle:” into the search bar tells Google to return results containing the keywords in the URL string or page title. Finding opportunities is the easy part. If you really want the link you have to fit your business to their column. Here’s a recent example (NOTE: the news outlet chose to remain private, as they didn’t want an influx of requests). After using the search operators outlined above, I came across a local outlet that ran weekly features of networking events and speaking engagements. In order to get into the publication, I needed to align my content to theirs. From time to time I give free marketing seminars for local businesses. They’re a great way to meet potential clients and provide value in the community. I didn’t have one planned, but I’d gladly set one up for free press! Just like that, I had a relevant pitch. Bakery — We found a journalist covering businesses that give back to the community. We set up a food drive for local shelters in the area and contributed a ton of baked goods. Bar / lounge — We found a journalist covering innovative business ideas. We launched an initiative that gave customers 5% off of their bill if they Instagrammed a photo of their favorite drink and tagged the location of the bar. Mobile app — We found a journalist covering entreprenuers that were born, raised and educated within the city. No extra marketing efforts needed! This part isn’t required, but it helps. A reporter always asks for more information. I find sending them a link to an online press release shows them you’re making a conscious effort to drum up press, not just mooching links. 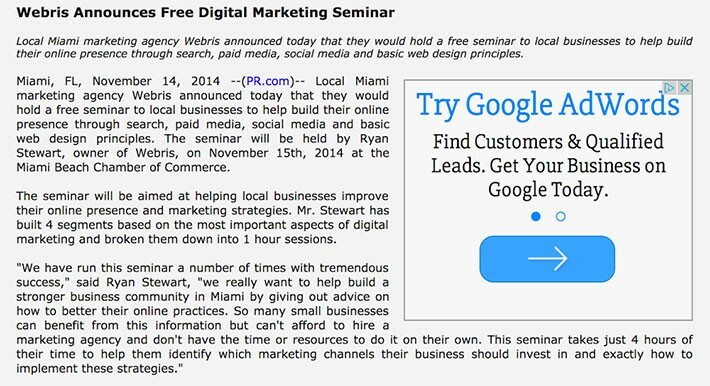 Screenshot of a press release from a previous seminar we gave. There are hundreds of free press release submission sites — any will do! I’ve been reading your publication on news.com for quite some time. If interested, I have a tip about a local business that fits right in with your column! If they like what you have to say, they should respond with their contact email. From there, I sent her the link to the press release as well as the page on my site. Two weeks later, she included my business in her update. Getting the link was a lot of work, but well worth it. Just 3 hours after the link went live, I received 126 quality visits, including 2 leads, both of whom I secured as clients. Networking = link outreach, version 2.0. 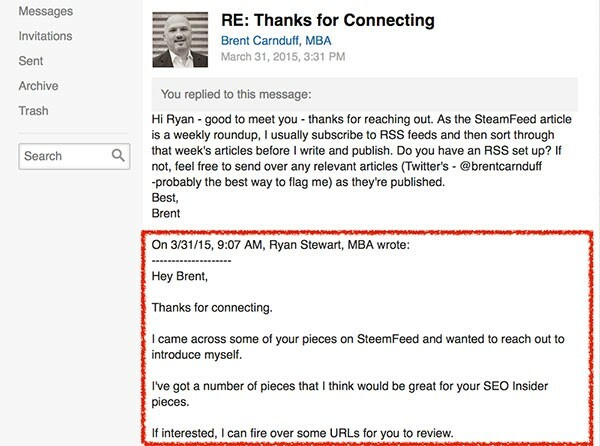 Broken link building: finding sites with broken links, emailing them to notify and giving them a link with similar content to fix it. 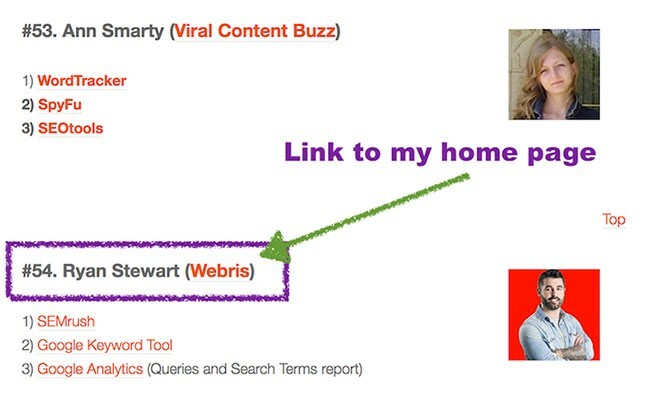 Updated content link building: finding sites with similar content, identifying links to dated content, emailing them to notify and giving them a link with more relevant content to replace it. This wasn’t always the case. When I first started using white hat techniques success rates were as high as 15%. 68% of companies say content marketing is their top priority. They’re spending money and resources to create engaging content for their audience. Finding a broken link in their page doesn’t qualify your content to replace it. “People do business with people they know, like and trust”. It’s the same with linking. Website’s link to sites they know, like and trust. That’s where networking comes in. Link outreach targets contact emails scraped from a long list of sites. Networking targets the people behind the content. By simply connecting social media you have a number of ways to get their attention the right way. The best place to start is with sites that do link round ups. These sites are actively seeking links to share so success rates are always higher. Once again, use advanced search operators to identify opportunities. You want to make sure that website is actively posting round up updates. Using the search operators you should be able to find a few dozen targets. Resist the urge to email them directly! 99% of sites will list their social media profiles in the author box. Pick a couple platforms and connect. Just finished your article on [site.com]. Love your work! It’s an easy way to break the ice and let them know you exist. Provides value: by re-Tweeting and sharing you’re spreading their content’s reach. If you have a decent social media following, you can help drive quality traffic to their site. Grabs attention: by re-Tweeting and sharing you’re getting their attention. Every time my links are shared I check the source. This often leads to me poking around their profiles and checking out their sites. I like to re-Tweet, share, comment and interact with their content at least once a week for a month. In my experience, this is enough time to get their attention and recognize your name. Now, the ice is broken. Feel free to reach out with a request to be featured. A few weeks later, I published a piece of content I thought would be a good fit for his round up. I Tweeted him the link. Later that day, I noticed an increase in referral traffic. 8 months later, I’m still learning the white hat techniques. While white hat techniques are more work, they provide better results. If you put in the time and effort, your results will reflect it! Would you argue with that? Originally published at blog.ahrefs.com on May 11, 2015.